Half the fun of traveling – at least for me – is planning the trip. This morning I spent a delightful half hour or so (okay, so we talked for almost two hours) on the phone with my dear friend Ginny discussing her upcoming trip to Germany. Later this month Ginny and her husband Todd are going to Esslingen, located on the outskirts of Stuttgart, where their son Will is spending the fall term of college. While Will is busy with his classes during the week, Todd and Ginny would like to take two or three days to explore interesting places within a reasonable driving distance. So as we were chatting, I Googled a map of Germany and saw three cities I’ve visited that I think Ginny and Todd would love: Rothenburg, Nuremburg and Bamberg. Rothenburg could be their first stop, since it’s only about a two hour drive from Stuttgart. If I remember correctly, the drive to Rothenburg is on the “Romantic Road,” which was nice but I’m not sure where the romantic part comes into it. I would call it the Bucolic Road. I just remember farms. It actually looked a lot like Ohio. But I digress . . . . 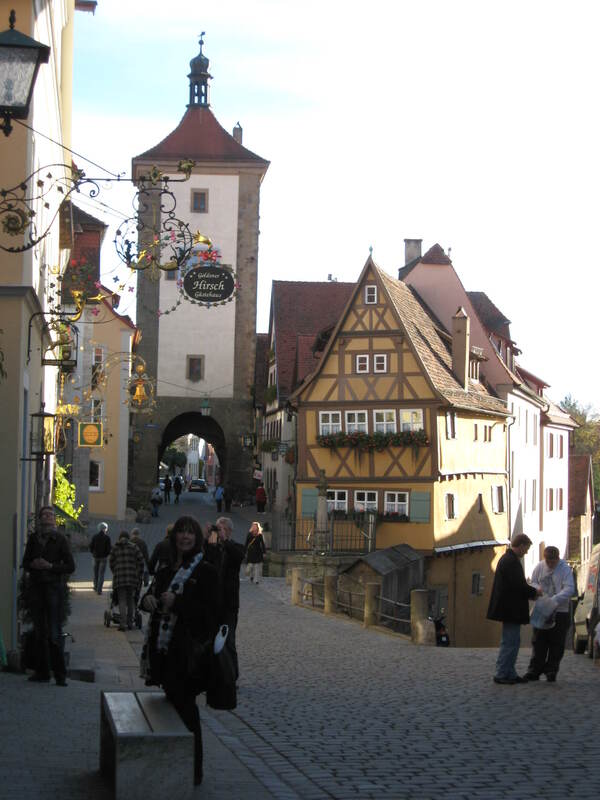 When my hero Rick Steves discovered and featured Rothenburg in his books and television programs a number of years ago, his admiration of the ancient walled city inspired countless other travelers to visit this picturesque town. 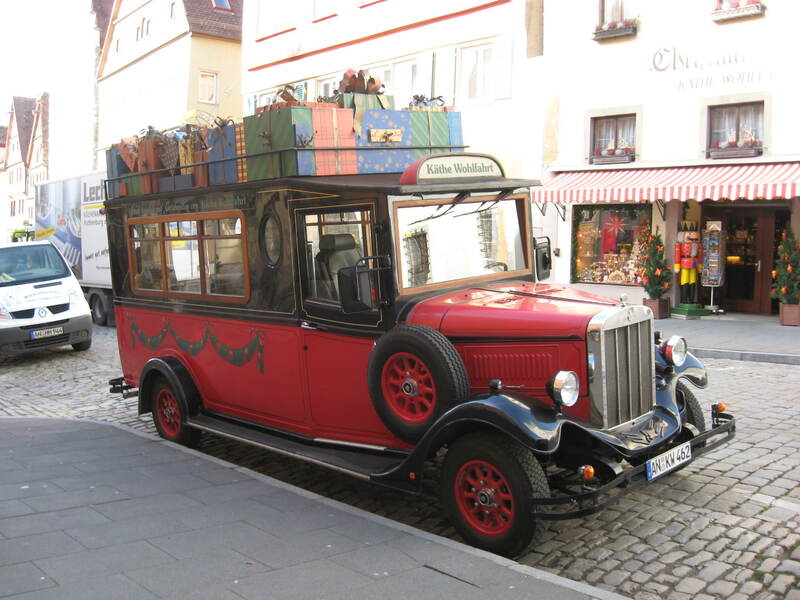 Rothenburg became a “must see” for Steves’ fans visiting that part of Germany, and every day tour buses fill the parking lots outside the walls while their passengers swarm the city from morning to late afternoon. So, I’m thinking if Ginny and Todd decide to drive over a little later in the day and spend a night there, Rick says evenings are much quieter and there’s a wonderful tour every night conducted by the city’s Nightwatchman. Decked out in medieval garb and sharing the city’s history in a wonderfully entertaining fashion, the Nightwatchman’s nighttime stroll would be memorable, I think. 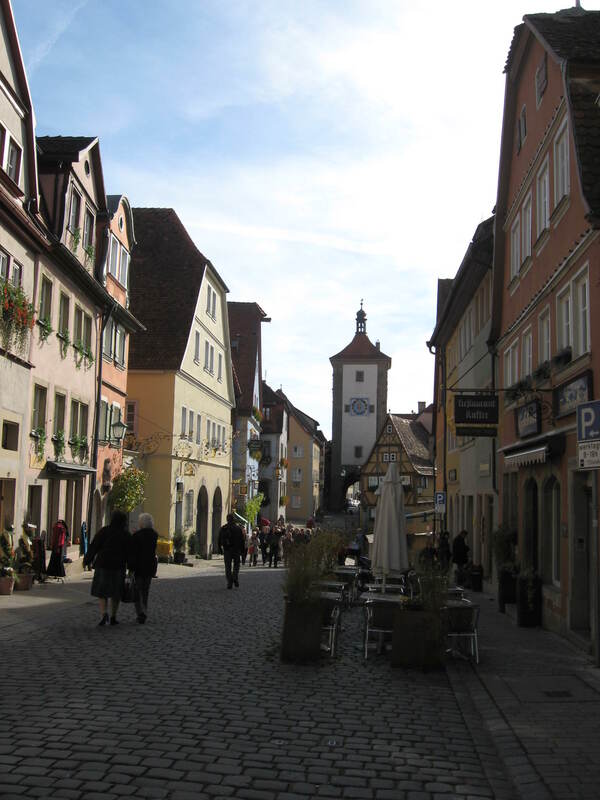 Click on this link to Rothenburg’s tourism website for more information about this fascinating city. Note to Ginny: Park Todd at a friendly pub for a beer and make a beeline to Kathe Wohlfart’s Christmas store. It’s November –don’t miss this! I’ve never seen so many Christmas ornaments and decorative items in one place in my life. Bring plastic! Note to Ginny and Todd: Do not be tempted to try the Schneeballs (snowballs) you will see in every bakery display case in Rothenburg. They look cute, but have the consistency of sawdust. Seriously. Go for the strudel, instead. Next morning, drive on to Nuremburg. Now, here’s the deal. I’m not exactly a WWII history buff and what little I remember about Nuremburg was that trials for war criminals were conducted there shortly after the war ended. I did not have high expectations for Nuremburg, since I’m more apt to get excited about Christmas stores and art museums and cathedrals. However, being a naturally curious person, I was certainly open for whatever I might come across there. Well, Nuremburg is amazing. Amazing! I suggested that you find a half day tour to learn the history from a good guide and I know you’ll be looking into that, possibly with Viator (a handy source for tours of different lengths in cities all over Europe – and maybe even around the world, but I don’t know beyond Europe, personally). I mention Viator, which has worked well for me, but just Googling tours or guides for any city will open up many interesting options. Standing where Hitler reviewed his masses of troops goose-stepping by, arms raised in the infamous salute and faces turned toward their fuerher? Well, it was just chilling. We’ve all seen the old news reels of those terrifying times. Going to the actual place where so much of this happened, accompanied by a knowledgeable guide, is an unforgettable experience. A good guide will bring it all to life and tell tales of the Third Reich and its leader that will simply astound you. Hopefully your tour also will include a visit to Nuremburg Castle, once one of the most important imperial castles of the Holy Roman Empire. The castle is perched above the city and you will enter it through ingenious tunnels designed to deter any armies attempting to storm the gates. Sharp turns made it impossible to maneuver long pikes or logs to ram the doors, and hatches could be opened above to pour hot oil (or other harmful and/or disgusting substances like hot URINE – yuck!) down over the marauders. One of Germany’s oldest and largest Christmas Markets is held each year in Nuremburg’s huge main square. It will be too early for the market when you’re in the area, so after checking out the city’s other sites maybe you could have a meal at the Bratwurst Roslein restaurant. This restaurant has been serving rustic Franconian cuisine in the Old Town since 1431 – before Columbus even discovered the New World! Hard to imagine, isn’t it? My last suggestion is to visit Bamberg, north of Nuremberg in Upper Franconia (doesn’t that sound like a place where the Marx Brothers went?). Bamberg was recorded as a settlement on the Regnitz River in 902 and its charming historic city center is a UNESCO world heritage site. 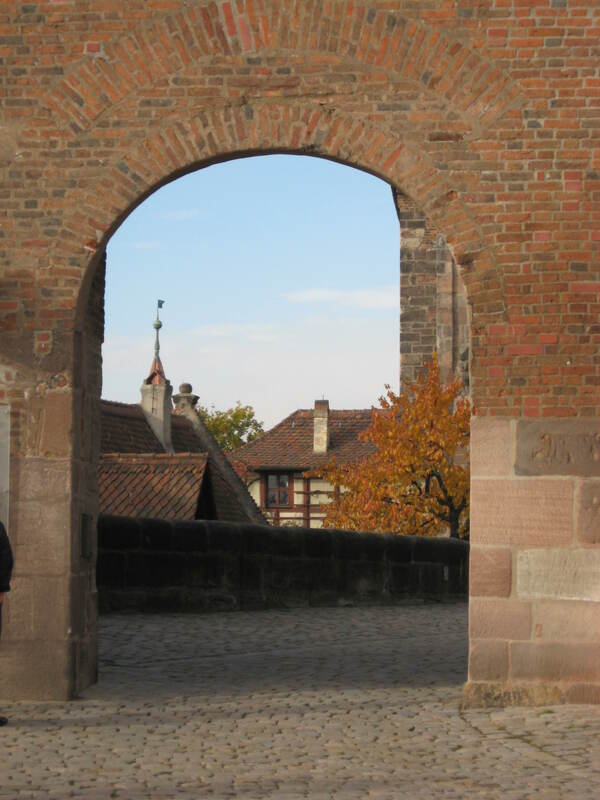 I especially love the bridge that tunnels right through the rathaus, or town hall, and over the river to connect the old town with the new. This is where I learned that Germans celebrate Halloween. I don’t know why I was surprised, but I was. 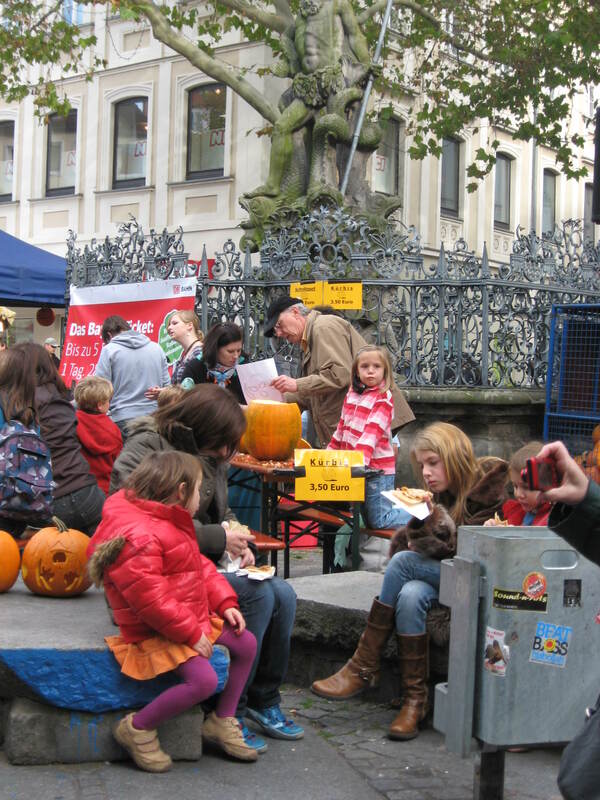 And I don’t know if the kids go door to door, trick or treating, but on the Saturday afternoon that I was in Bamberg the local children could buy and carve a pumpkin in the market square. Pop music played over the loud speakers and the rest of the square was filled with stalls selling everything from flowers to scarves and mittens. 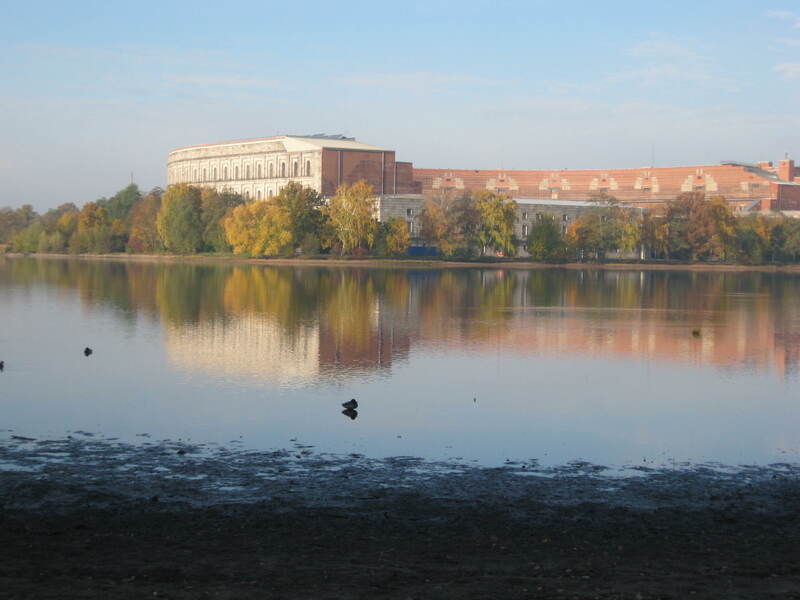 Has anyone else reading this post spent any time in this part of Germany? Please share here if you’d like to recommend a place you think Ginny and Todd might enjoy. Oh, how I’d love to go back and see these beautiful places again – not to mention visiting so many other spots I haven’t yet explored! Like Geigweis. Why Geigweis? Well, Geigweis is also known as Dachshund Village and practically every home has a kennel. 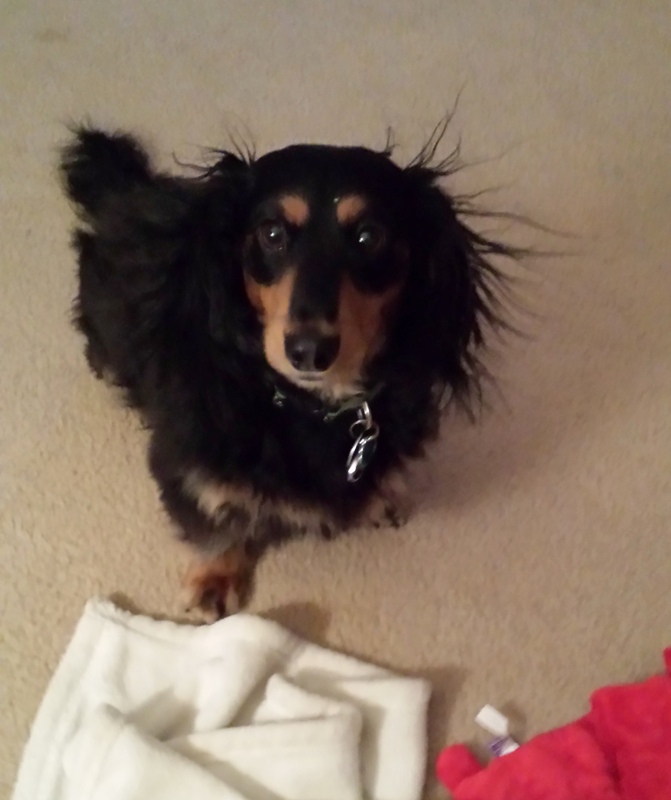 You’ll find short hair, long hair and wire hair dachshunds. You’ll find minis, tweenies and full size dachsies. And if you don’t have a dachshund of your own, you can borrow one to take for a walk around the town while you’re visiting! To be honest, this is seriously old information I ran across on the internet a while back and I have no idea if Geigweis is still the home to all things dachshund today. But seeing as how it’s only about a three hour drive from where you’re staying, please bring me back a surprise if you happen to visit there, okay? Happy travels, my friends! Love you! This entry was posted in Travel and tagged Bamberg, Christmas, Dachshund, Geigweis, Germany, Halloween, Kathe Wolfhart, Nightwatchman, Nuremburg, Rothenburg, Schneeball, Stuttgart. Bookmark the permalink. 7 Responses to Ginny’s going to Germany! I love you SOOOO much. Thank you Pea! I visited all three of these places last spring on Viking River Cruise. It was third time in Rothenberg. Would agree that you spend the night there. When I did that it was September and we did not have reservations–just found a place on the spot outside town where vacancies are listed and there is a phone there to call. We booked a place inside the wall, but when we got there, the people who had originally reserved it (that the owners believed were not coming) showed up and got the place. But they found us a place just outside the Hangman’s Gate that was very convenient. Eat anywhere and you will have a great meal and have locals all around. Don’t know your physical condition, but on first visit we climbed to the top of the Rathhaus Tower–quite an experience. One of the towers (Red Gate, I think) is the only one you can climb to the top and up there you get a great view of the whole restored town and there are post WW II photos showing how the city was half destroyed. It was supposed to be bombed to pieces because German troops were “hiding” in there, but the AF Commander’s mother had visited Rothenberg before the war and he could not bring himself to order destruction of her beloved city. Restoration money came from all over the world to enable it to be rebuilt to its medieval splendor. Rothenberg to Nuremburg is easy drive. We did it opposite direction after visiting the Nazi Museum and sites. The Castle is a must see and ditto on getting some wurst at some place around Market Square. The Viking cruise was my first opportunity to visit Bamberg and it is a charming place. The cathedral and the original palace built around 1000 AD are worth the walk up the hill. We were too early to see the rose garden in bloom and you will be too late, but the view from there is great. I just love that area of Germany and all Bavaria. I hope you have a great visit and also hope your son gets to know the area he is studying in. When my son spent a year abroad in Luxembourg, they did all sorts of traveling. Even if you don’t know German, it is easy to get around as most everyone knows enough English to be helpful to tourists. Jayne, thanks so much for sharing your insights. I’ll be sure Ginny sees this! You are amazing! I love how you put this all together and will save this in my archives in case I ever get to this area. They sure sound like places I would like to visit/tour/eat/shop. Thanks for sharing your talents once again. Thanks so much, Chris! You made my day! Thank you, Michi! I will pass this information along to my friend, Ginny. I know she and her husband love good beer!